Thor hammers down the action and humor! Looks like Chris Hemsworth is making on his way to his latest “Thor” entry: facing the power-hunger sister, Hela (Cate Blanchett) and the impending doom of Ragnarok that will conquer Asgard. The third film happens to be a whereabouts of Thor and Hulk, missing out on the events of Captain America: Civil War. Seems like a mystery. They been focusing on something different. The main film tells about Thor, who was searching the Infinity Stones, got imprisoned into the devil’s demon, Surtur. Once he battles Surtur, he returned home with the Surtur’s crown and wants Loki to know where Odin is. Using directions from Dr. Stephen Strange (Benedict Cumberbatch), they found Odin who was dying to allow Hela, a first-born daughter who is overambitious on ruling Asgard, to escape from prison. They battle and simply fled to Asgard. Hela arrives in Asgard and resurrects her army who fought with her. Meanwhile, Thor crash lands to Sakaar and was captured by Valkyrie (Tessa Thompson), under the ruler of the Grandmaster (Jeff Goldblum). This led Thor to battle his greatest opponent: Hulk. 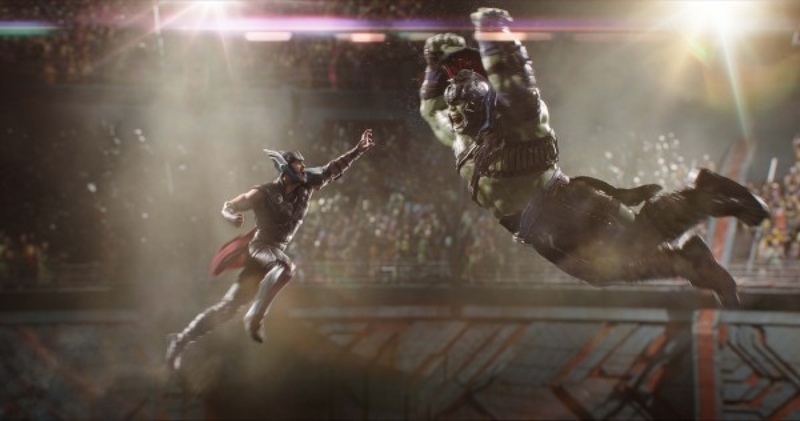 Together, Thor persuades Hulk and Valkyrie, along with Korg (voiced by Waititi), the rocky gladiator, to assist him to defeat Hela. Overall from the film, “Thor: Ragnarok” was one of the most viewed MCU films ever in the universe with a perfect need for the plot and perfect emotion to Thor and Loki. Great film for a Halloween /Thanksgiving treat and for Marvel fans out there. No complaints on this, better get this on DVD sometime in early 2018. You’ll be stunningly surprised from what Disney and Marvel Studios did. So, better save your energy on any movies you planning on seeing right before the film’s opening day. Remember the phrase from “Jurassic Park,” “Life will find a way” by Jeff Goldblum and John Hammond’s “We spared no expense” quote. Nuff said! Well thanks. No need to see it now. You forgot to mention matt damon as loki.